Two fashion powerhouses join forces. Gucci and luxury menswear retailer, Mr Porter, have joined forces for an exclusive capsule collection, which is due to launch next month. The collaborative line, which follows the success of a similar initiative by Gucci with the platform's sister company Net-A-Porter in 2016, will debut on May 18 and will comprise of 43 pieces, "inspired by urbanism and self-expression, anchored in classic tailoring silhouettes and eccentric sportswear". Crafted under the creative direction of Alessandro Michele, the capsule collection will incorporate the ready-to-wear, shoes and accessories categories and merges Mr Porter's traditional English-tailoring roots and Gucci's Italian romanticism, featuring a vivid colour palette of zesty oranges and yellows, azure blues and Bordeaux reds. 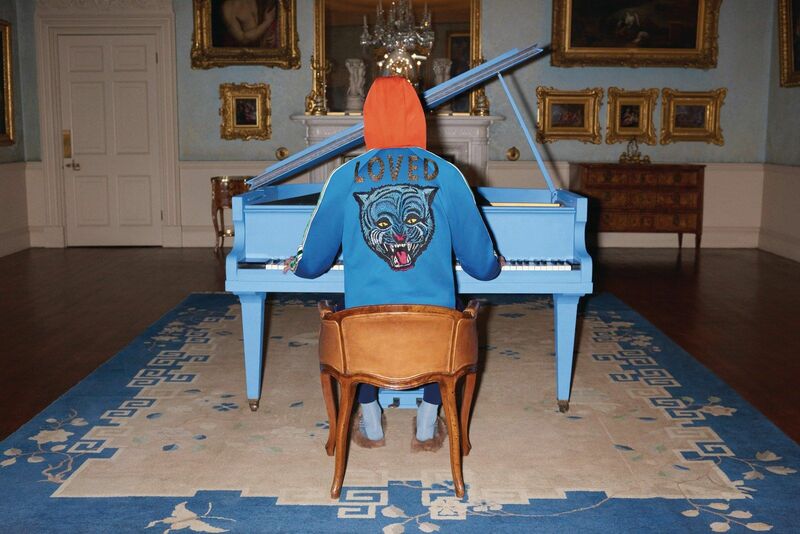 Predominant through the collection are Gucci's iconic motifs such as the bee and tiger, and the newest additions, such as the skeleton and the cat, that are playfully emblazoned across the body of a blazer or pocket of a pair of washed jeans. Stand out pieces include a lilac fil coupé shirt, a yard wool jacquard bee crewneck sweater, a blueberry-coloured technical jersey zipped jacket with paisley print and embroidered tiger, and a pair of iconic horsebit loafers in a GG wallpaper print elaborated in striking mimosa. The rest of the collection features blue-washed five pocket jeans, prep school-inspired tailored jackets and trousers along with two formal suits, technical sportswear, and small accessories including leather bracelets, cufflinks, ties, watches and scarves. A yellow Gucci label will feature across each ready to wear piece, unique to this exclusive capsule collection.